A masterful reinterpretation of Lovecraft's tales by Alan Moore, one of the greatest graphic-novel writers living today. Provocative and brilliantly researched, Providence is like looking at Lovecraft's works again for the very first time. We await Act Two with bated breath! 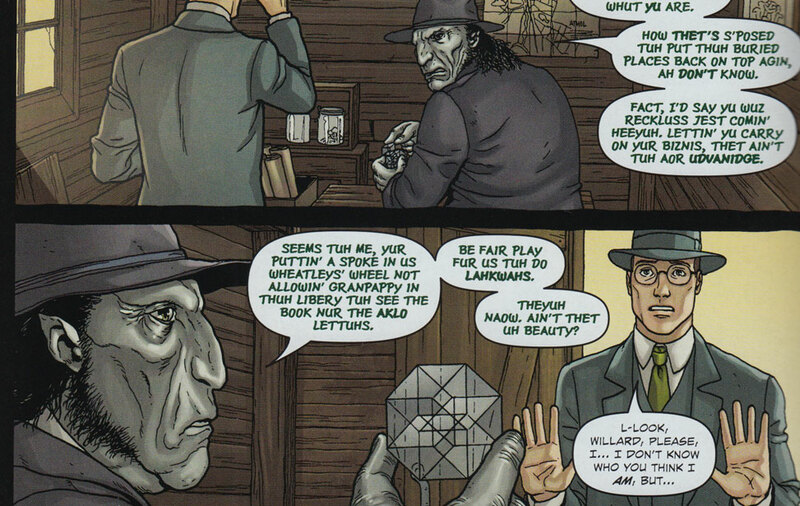 When considering the graphic novels of Alan Moore it is difficult to speak within small compasses. For readers of comic books, the English writer needs little introduction; however Moore is also one of the few writers within the medium whose reputation can be said to have broken out to a wider audience. Seminal works such as V for Vendetta, From Hell, League of Extraordinary Gentlemen and Watchmen from his pen have all been made into successful big-budget movies (of admittedly varying quality) to the extent that the average man in the street is likely familiar with Moore's stories even if not his name. Any one of these volumes would have been sufficient to earn him a reputation as one of the great contemporary writers of fiction – that his corpus includes several books of this stature arguably elevates him to the peerage of the greatest authors of all time. 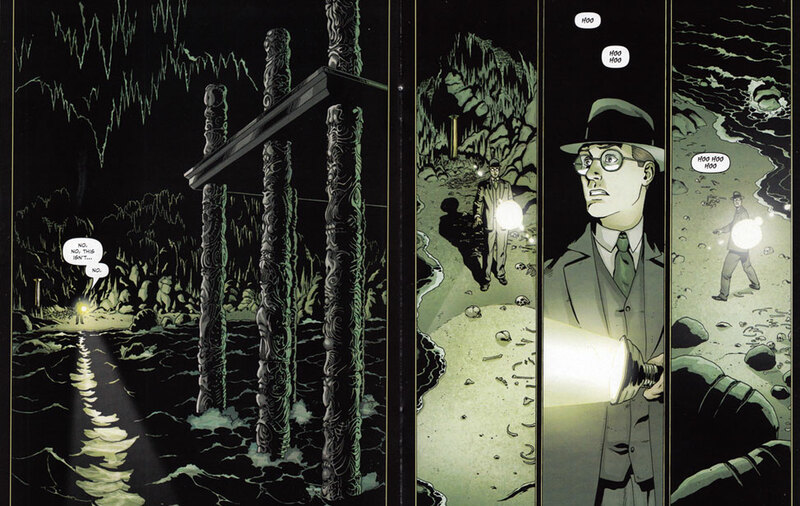 It was therefore with some excitement (and a little nervousness, for Moore does occasionally produce a damp squib) that I approached Act One of Providence, Moore's new graphic novel (illustrated by Jacen Burrows) based upon the works of our revered Lovecraft. I am delighted to report that after reading this first of three volumes that Providence bears every hallmark of being one of his greats. The plot, so it appears thus far, is reasonably simple. Set in 1919 our protagonist, Robert Black, suffers a personal tragedy prompting him to take a leave of absence from his career as a journalist in order to travel New England researching material to write the next "Great American Novel", Black intends to write about life on the cultural fringes of American society, using the supernatural – and conventional society’s fear of it – as a metaphor for social outsiders. Accordingly in each chapter (Act One collecting the first four) Black exploring a new location and interviewing the locals. Very lightly disguised, both the locations and individuals will be instantly recognisable to those familiar with Lovecraft's life and works. This bare-bones overview however does no justice to the incredible complexity and depth that Providence possesses. Moore's best works are incomparable; the richness of his settings and extensive detail included in every phrase and panel are products of the prodigious research he famously undertakes; and the remarkable complexity of his narratives are indicative of many hours spent at the story-board, carefully structuring and plotting every aspect of his novels. This is all in evidence - in spades - in Providence. Moore has not tried to copy or emulate Lovecraft's source material directly. To do so — as many mythos writers have done over the years — is surely little more than pastiche regardless of how ably done. Instead he has gently reworked them to give the impression that Black is researching a reality that was behind Lovecraft's tales. The supernatural is gradually hinted at; the atmospheres are eerie, unsettling and unusual; at first it is not clear if anything unnatural has taken place at all; more than once something terrifying is revealed, in full view of the reader, but its significance only becomes clear - sometimes monstrously so - when a further detail is supplied later in the tale. I found myself frequently skipping back a few pages to re-look at something, suddenly understanding what had likely taken place. While initially a little slow, this form of storytelling is remarkably effective. As Providence begins the world seems normal. Black's investigations gradually scratch away at this veneer and a remarkable cumulative uncertainty develops. Is this the reality of Lovecraft’s tales or are we merely seeing the supernatural where none exists? Are we seeing evidence of ancient gods and human debasement, or are we merely projecting our own expectations and fears onto an unfamiliar — but ultimately conventional — reality? Are we merely imagining the worst in these cultural outsiders or are they truly monsters and sorcerers? The reader is uncertain. Those familiar with Lovecraft may perhaps infer what is likely happening under the surface, but nothing is ever made explicit. Providence’s storytelling is an exercise in subtlety that cleverly ratchets up tension in spite of very little obviously happening – and when something does happen, the ambiguity remains. 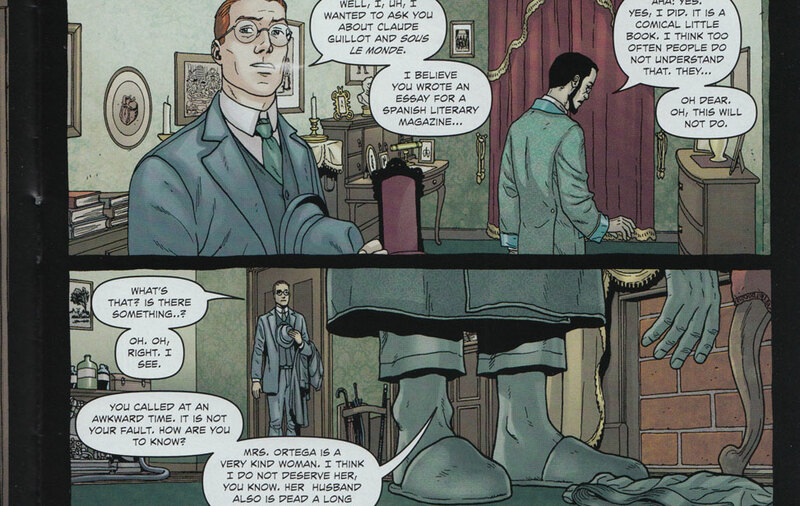 Some of the most nerve-wracking moments of the book occur when the reader, likely familiar with Lovecraft, is fully aware of what has been hinted at and of the terrible peril that Black is in – but our protagonist remains quietly oblivious. Providence is not a light read. We have to concentrate on following the many threads Moore has left for the reader to tug on and – while this is rewarding for the reader who takes the time to unpick and follow them through – this may require concentration and effort. Providence has almost no action – but it has incredible detail, both in the text and in Burrows' artwork, to explore and enjoy. Those intimately familiar with Lovecraft's life and works will likely get all the more out of this process, as Moore has clearly researched his subjects very thoroughly. 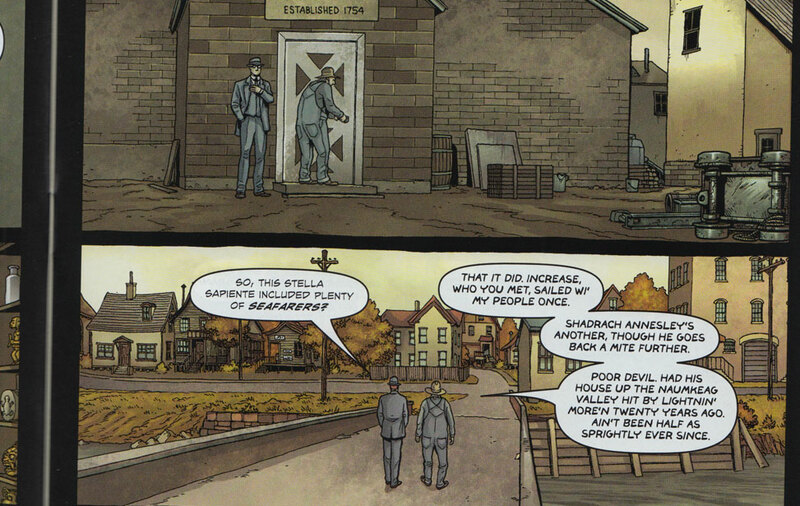 Worth mentioning also – an interesting narrative technique that Moore also uses in Watchmen – are the are extensive extracts from Black's "Commonplace Book" between every issue. Clearly inspired by Lovecraft's own Commonplace Book, Black's version functions more as a journal and scrapbook. As well as giving further insight into the protagonist's character and thought processes this also allows Moore to squeeze in even more detail to his tale and settings — and leads to even more flicking back-and-forth as you re-read sections or examine a panel of artwork more closely. It's fair to say that very little actually happens in Act One of Providence. The vast majority of the book is taken up by characters talking and walking and examining the scenery. I wonder if things may kick up a notch in later Volumes — but it hardly seems to matter. The richness of the setting and the cunning meticulousness of Moore's narrative kept me engrossed throughout. Moore's new interpretation of Lovecraft's works is incredibly fresh and enthralling – it is like reading them again for the first time. Even better, it is like reading them for the first time but with the benefit of experience. I eagerly await the release of Act Two in June. Editor's Note: The work reviewed here is a hard-cover collection of the first four issues of the Moore/Burrows comic book Providence, which has already been published in its entirety of 12 issues.